Fairy kei is a Japanese street fashion that sports the colors and motifs of the 80s and early 90s. Fairy kei wearers use pastel toned colours, to create outfits that are cute, yet still retain an elegant appearance. Here at Petrifeye.co.uk we’re offering a huge range of Fairy Kei Fashion Contact Lenses, which are perfect for those who want to add a bit of edge to their Fairy kei outfits! Take a look at these Glamour Violet Fairy Kei Fashion Contact Lenses, which feature an elegant and vibrant pink that is perfect for fairy kei. As these lenses use three different shades of colours to give your eye a realistic and unique appearance! These lenses last for 90 days after the first day of opening, which means you, can wear them for everyday wear! Check out these unique Eyelush Aqua Fairy Kei Fashion Contact Lenses, that have an elegant black lace pattern, against a stunning aqua toned background. These lenses are ideal for those who want to achieve a stylish and unusual look! These lenses last for 90 days after the first day of opening, and provide all-day comfort too! Their 14mm diameter means that they will make your eyes appear bigger and brighter, giving them a more defined appearance. That is ideal for those who are looking to achieve a doll eyed look! 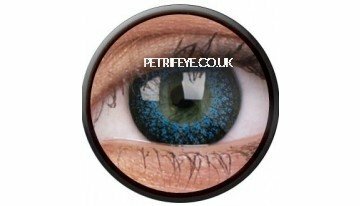 Visit Petrifeye.co.uk for more of our Fairy Kei Fashion Contact Lenses!Also, whilst you’re there, check out our Fashionable Contact Lenses, and our Costume Contact Lenses, which are all available for low and affordable prices!